After their mention in Entrepreneur, these former Young Millionaires, including Liz Lange and Tony Hsieh, skyrocketed to success. Find out what lessons they've learned, and how their companies have evolved. What do Sir Richard Branson and Michael Dell have in common? Aside from their obvious success and wealth today, they were both recognized by Entrepreneur magazine as "Young Millionaires" in the late '80s. When we first interviewed Dell, he was 23 years old and fresh out of college. He spoke about the struggles of running a $6 million business while attending school, but said the rewards were more than worth it. And you can bet that today, as the world's second-largest PC maker, he'd say the exact same thing. Our past Young Millionaires have plenty in common; for instance, many of their ideas were initially greeted with skepticism. That's what happened to California Pizza Kitchen founders Larry Flax and Rick Rosenfield, who told us in 1986 that people thought they were crazy for going into the restaurant business. Yet today, CPK is an industry leader with more than 210 locations in 29 states and eight countries. When we first highlighted the businesses below, they were relatively unknown. But now, they're household names virtually synonymous with the products they sell. Find out just how far they've come. Then: In 1996, prospective retailers told Lange that pregnant women wouldn't spend money on her sophisticated maternity wear. Ignoring them, Lange borrowed money from friends and family and opened a small office in New York City, where she sold made-to-order clothing to women by appointment. Thanks to word-of-mouth, Lange's business started booming, and in 2001, she reported $3 million plus in sales. Now: Lange continues to prove those retailers wrong. Today, the Liz Lange Maternity Collection, which celebrates its 10th anniversary this month, can be found at Lange's three Liz Lange Maternity flagship boutiques, and her secondary line, Liz Lange for Target, is the exclusive maternity line at all Target stores and on Target.com. Though Lange wouldn't release sales figures, she says the company has grown in huge multiples since 2001. Lange adds that her constant activity, which includes lecturing around the country, writing her monthly column for Prevention magazine, and spending time with her family, suits her perfectly. "I'd be very bored without it. I've always dreamt big, but never thought it could be like this," she says. "Not a day goes by that I don't get stopped on the street or receive an e-mail from someone telling me I made a difference in their life." Then: How many companies can say their second year of sales surpassed their first by 400 percent? Not many. But Oliver Peoples, which began selling antique eyewear in 1986, reported that statistic to Entrepreneur back in 1989. "The business has been a giant success, and we're still young!" said Leight. In 1987, Oliver Peoples created its own brand, Oliver Peoples Eyewear, and named Leight the chief designer. Now: Oliver Peoples is now preparing to launch its 20th anniversary campaign and showcase its new collections. 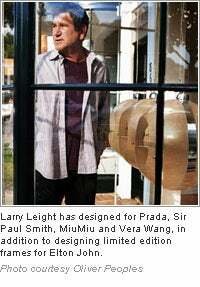 Since we last spoke with Leight, he's been named one of the top nine American designers by Conde Nast Publications and Ford Motor Company. Though the company has changed, it's continued to grow dramatically. In fact, Leight says the company continues exceeding sales projections each year. Perhaps the most important business lesson Leight has learned is to not give up. "Even if everyone is against you, if you are passionate about something, you have to fight for it," says Leight. As for the next 20 years, Leight hopes to continue designing expressive, stimulating eyewear that will appeal to the brand's global clientele. Then: Sometimes you have to test out more than one path before settling on a career. That's what Allred learned after graduating from the University of Southern California and getting involved with real estate. After he realized it wasn't the right path for him, Allred decided to take a leap of faith and gather $110,000 from friends and savings to build his company, creating Hawaiian-print clothing. When interviewed in 1999, Allred's 7-year-old company was expecting to double from $5 million to $10 million in sales that year. Now: When we last spoke with Allred, he said he hoped his casual, classic surf clothing would become timeless fashion. Now, with 33 employees and about eight years under his belt, Allred can be confident that Toes on the Nose has done just that. Though Allred prefers not to release his total sales volume anymore, he says the company has been focusing on expanding internationally and has established beneficial partnerships with International Marketing Group. "We're doing a lot. We've leveraged our brand in different marketplaces, which has allowed us to grow with the help of other peoples' expertise," says Allred. But more than anything, Allred says the last 15 years have taught him the importance of a good internal support team. Since his marriage and the birth of his daughter, Allred has been forced to learn how to delegate and trust in others' abilities. Then: It all started in 1999 when Nick Swinmurn made an unproductive trip to the mall in search of shoes. Disappointed by his lack of purchases, Swinmurn got the idea for Zappos.com, a one-stop shop for men's, women's and children's shoes. But first, Swinmurn needed financial backing. He persuaded Tony Hsieh, who had earned $270 million from selling LinkExchange to Microsoft in 1998, to jump on board. "On the surface, it seemed like the quintessential poster child for a bad dotcom idea," said Hsieh four years ago. But after recognizing the $40 billion market, Hsieh saw potential. By 2003, the company was projecting $65 million in sales. Now: Potential was an understatement. This year, Zappos.com--which is derived from the Spanish word for shoes, zapatos--is projecting $800 million in sales, bringing the company that much closer to its original goal of achieving $1 billion in gross merchandise sales by 2010. But not everything has remained constant with the company, starting with its image. "Back in 2003, we thought of ourselves as a shoe company that offered great service. Today, we really think of the Zappos brand as about great service, and we just happen to sell shoes," says Hsieh. Zappos.com has expanded by adding apparel, handbags, sunglasses and watches to the site, and is promising more to come. Another key change: Founder Swinmurn left Zappos in 2006 to start STAGR, a website focusing on customized apparel. Then: From the beginning, Aigner-Clark's business ambitions have been focused on her family. They started with her infant daughter, Aspen, in 1995, when Aigner-Clark realized there were no age-appropriate products for sharing her passion for art and classical music. So the former teacher took matters into her own hands and created her first video, Baby Einstein, featuring captivating pictures and mothers speaking different languages. After pitching her idea for two years and not making any progress, Aigner-Clark got her big break at the American International Toy Fair in New York City, where buyers snatched up her product. By 2000, the company had reached sales of $10 million. Now: In 2001, Baby Einstein was acquired by The Walt Disney Company, who continues nurturing the brand and has seen sales climb past the $200 million mark. As for Aigner-Clark, it's been a bittersweet transition. "It's not as if my 'baby' grew up and went to college; it's as if my baby was picked up by an alien space craft and beamed to another planet," Aigner-Clark says. Perhaps the best lesson she's learned through it all: "Don't take anything for granted. Enjoy the moment. Recognize the beauty and good fortune. And take pictures." This ambitious mother of two, who was diagnosed with breast cancer in 2004, shows no signs of slowing down. She recently started a new business, The Safe Side, a nonprofit that deals with children's safety, and she's gone back to her roots by teaching literature two days a week.